This has been an important year for the JAFF community due to the 200th anniversary of Jane Austen’s death, and as you know, several events were organised in the memory of our favourite author. I was lucky to be present in some of the events that occurred in England last July, but I never expected to have an opportunity to participate in something of the kind in Portugal. However, a couple of months ago I heard about a conference that was going to take place in Lisbon to celebrate Jane Austen’s life and work by discussing how her books form part of the contemporary experience of love, gender, family, social and pecuniary relations and how her writing style, her silences as well as her favourite topics, and her language have shaped modern-day literature, both in the UK and abroad. In a nutshell, that conference aims to discuss both the author’s rootedness in the late 18th and early 19thcenturies, her authorial longevity and acumen, and her pop star fame in the last 20 years. 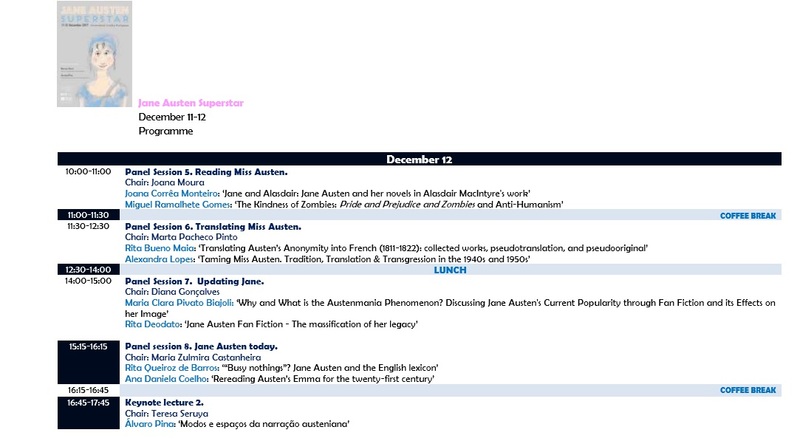 I was immediately interested in attending this conference but I also saw an opportunity to discuss JAFF amongst scholars and to show everybody how relevant and diverse this genre is, so I filled myself with courage, and with Nicole Clarkston and Joana Starnes’s assistance wrote an abstract to apply as a speaker. I didn’t have a lot of hope of being accepted because I’m not a scholar and this was clearly out of my league, but guess what? They actually thought my theme was interesting and they liked my application, so I was accepted!!! I am very excited to be participating in such a great and important initiative, but also a little nervous, so I would like to ask you all for some help! I would feel much more comfortable if I was able to bring some statistics with me, I believe that would give my presentation more credibility and visibility, so I would like to ask all my friends who have been supporting me for the last 2 years, to please spare 3 min of your time and fill the below questionnaire that the lovely and kind Meredith from Austenesque Reviews helped me build. The questionnaire is anonymous and aims to understand the JAFF community a little better, it will help me to have more data to support my presentation and give me more strength in the representation of the community. I will be sharing the results of the questionnaire, as I’m sure you are as curious as me to know some of the findings, and I will also share with you my experience at the conference, but to thank you all for your kindness in collaborating with me, I would also like to offer one of my readers a JAFF e-book of his choice. To apply, all you have to do fill the questionnaire, and comment saying you have already done so (as it is anonymous, I’ll trust your word that you have done so). Sharing this post on the social media will give you extra entries for the giveaway, but please mention that on the comment as well so that I can keep track. I will announce the winner once I publish the results of the questionnaire, and the winner may choose the e-book he wants, as long as it is a JAFF book. I would like to thanks Nicole Clarkston and Joana Starnes for the help with the abstract that got me accepted as a speaker at the conference, to Meredith Esparza who helped me build the questionnaire, and to all of you who will fill this questionnaire to help me!!! Thank you for participating, and good luck in the giveaway!! !